I’m aiming at complete and utter honesty with the title of this post. You see I am reviewing–well not a review more like a hyper-hyped glimpse of a book I happen to love! I’m 100% sure that anyone who reads this book, will just love it as well. This book is from an author I happen to admire, respect & call a long distance mentor. 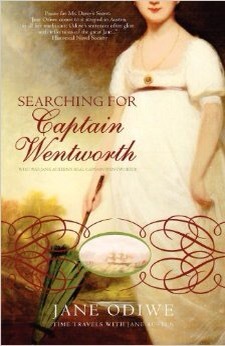 This amazing author is none other than Jane Odiwe and the book I’m about to rave about is “Searching for Captain Wentworth” It is an amazing ride Jane Austen herself would embrace and be proud to have inspired. Sophie Elliot, a broken hearted, sweet and trusting novelist in the making, received a rather mysterious package with a key. This random package came with a note from her great-aunt inviting her for a visit to Bath modern time. Sophie, happy to oblige takes the opportunity to do some writing and self discovery. However, Sophie doesn’t know that she is in for an amazing surprise! Sophie just like me – a huge fan of Jane Austen happens to discovers that the apartment or as my British friends would say “Flat” is in the same vicinity as that of her favorite author, Jane Austen. One day while looking out the window, Sophie observes her handsome neighbor Josh drop a white glove. This is the onset of a great adventure which had me in such excited state, I could hardly put the book down. The glove she later discovers can transport her back 200 years in time to Regency time. This twist time travel miracle takes Sophie to Bath. The magic here is that Sophia Elliot & Sophie happen to be relatives. There she meets and becomes friends with the Austen sisters- Jane and Cassandra. Sophie is then introduced to Jane & Cassandra’s brother, Charles. There is strong implication throughout the story, that perhaps we can find very possible romantic inspiration for Jane Austen’s “Persuasion” which is my very favorite novel! I wish I could tell you more, but I cannot rob you from getting the book & finding out for yourself. I think–no—- Actually, I know, you will enjoy the book much more than anything I may tell you in this ubber hype post. Love! Peace & Chicken Grease! This entry was tagged book review biased love jane austen love story read. Bookmark the permalink. Thank you, Adalgisa for the wonderful review-I’m so thrilled you enjoyed the book!